Support group exclusively for kids, Kids Under Construction (KUC). Kids Under Construction, “KUC” for short, is a support group exclusively for kids. It is designed to assist children in understanding and coping with a cancer diagnosis, whether it is their own diagnosis or that of a family member or friend. KUC provides a relaxed atmosphere for the kids to be comfortable with their emotions and bond with each other by participating in structured, therapeutic activities and outings. Contact office for more information. Update – January 2019 – The children’s support group is back and looking for children ages 6 to 12 years old that have someone in their immediate family affected with cancer. The program is six weeks long and meets twice a month on Wednesday evenings from 6:30 p.m. to 8:00 p.m., beginning in March 2019. According to the National Cancer Institute report, approximately 24% of adults who are diagnosed with cancer have school aged children. Studies suggest that children living with a parent or guardian diagnosed with cancer are under unique kinds of stress, which may place them at a higher risk for adjustment problems, inconsistent or poor academic performance, anxiety and behavior problems at school and at home. The importance of both understanding then attending to the psychosocial needs of children in this situation is critical to the continued healthy functioning of the family. 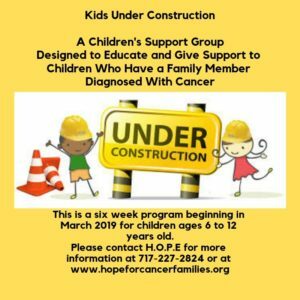 The H.O.P.E.’s Kids Under Construction Program (KUC) is designed to educate and give support for children whose parents are fighting cancer. Kids Under Construction was first started many years ago by H.O.P.E. to help children understand what their family member is they undergo can treatment. Having a family member with cancer means the child’s highway of life is “under construction.” Although it is a bit bumpy at the moment, the “construction” will end, and things will become smoother in time. To a child, living in a home with someone who is ill can be very stressful. The family’s focus is on the cancer patient and their needs, while the child might feel angry, neglected, or ignored. These emotions are often followed by feelings of guilt which can increase the child’s stress and frustration. In the KUC program, emotions are explored through art therapy. To assist the stress, children will be encouraged to talk about their feelings through art and games. KUC is also about having fun and bonding with other children who are going through similar situations and be mentored by knowledgeable adults. Children in families that are battling with cancer, often have to assume responsibilities beyond their years. In addition to school, homework, and regular chores, children may be called upon to provide care to the patient and assist with younger siblings. Because of this, some meetings will be dedicated to having fun. It might be a walk to Bonkey’s Ice Cream, or to going on a treasure hunt at the park, yoga, painting, roller skating and journaling. Visits to state parks and other outings give the children an opportunity to just be kids. Since the director Barbara Titanish is unable to be everywhere, all the time (although she’s close to it), she’s thrilled to have someone qualified help her run the program. Heatherlyn McGoff is, patient, energetic, enthusiastic, and perfect for the position. Heatherlyn plans to graduate from Millersville University May 2019 with a Bachler’s degree in Social Work. She also plans on attending graduate school this summer and becoming a Certified Arts Therapist. She has an Associate’s Degree in Social Science and has years of experience of working with at-risk youth and their children for a maternity group home.